What exactly is an ERP? 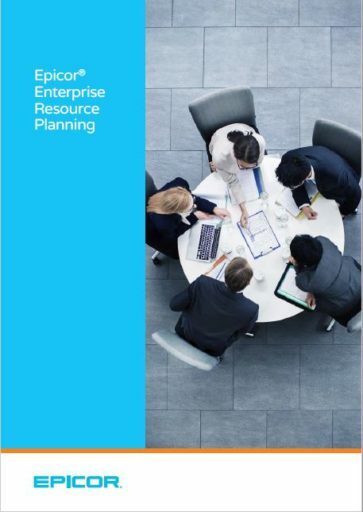 In its simplest terms, an Enterprise Resource Planning or “ERP” is a software that contains a suite of applications that help you manage your core business processes. These applications help you do everything from manage sales and inventory to provide you with vital HR tools. In turn, the ERP works as a signalized system, which not only streamlines your day-to-day operations, but also provides you with a variety of modules, each of which have their own characteristics, functions, and features. Our Epicor ERP software contain centralized ERP modules that have many functions. Really, you can think of each of these modules as providing different functional ERP system requirements that allow users to manage grouped tasks without having to worry about switching applications or screens. This software can be tailored to have specific functions of ERP that will benefit your business. Manufacturing – Epicor ERP modules can have their functions tailored to help you manage every part of product development and production without worrying about tracking various sheets, or charts. Accounting – The back-office is a vital part of every business. Epicor ERP has built in functionality that support accounts receivable, accounts payable and general ledger functions that help manage your finances easily and quickly. Customer Relationship Management – Having a great Customer Relationship Management (CRM) tool is imperative to any successful business. Epicor ERP’s CRM modules will help your business do everything from track campaigns to maintain vital client information. Inventory Management – You will always need to know what you have in stock and the exact proportions, with the ability to auto-fill orders or notify you when an order is needed for seamless production management. Epicor ERP’s Inventory Management module exchanges data with manufacturing, distribution, sales and customer records to ensure that you have the most up-to-date information on hand. The aforementioned functionality of the ERP modules available to you with Epicor ERP is simply one small glimpse into its capabilities. On top of being modular, these types of ERP modules rely on a centralized database, meaning that users across various departments are working with the same exact data. Additionally, while this data is centralized, individual modules can be configured throughout various departments (i.e. your HR Department won’t be able to edit your inventory management system). This high level of integration (yet siloed administrative capabilities) enable everyone within the company to work seamlessly with one another. Since everything is within one system, you don’t have to worry about a communication breakdown where key pieces of information are lost in the plethora of emails each department receives every day, avoiding costly and timely mistakes from human error. Call us at (888) 300-2340 to discuss how Epicor ERP can help you streamline your day-to-day business operations. Want more information on Epicor ERP? Download the Epicor ERP Product Brochure.